Make your own potato chips with these 6 simple ingredients. You'll never grab for those processed chips in the store again. Mix up the seasonings to fit your tastes and preferences. Preheat oven to 375 degrees F. Line a baking sheet with parchment paper or foil. 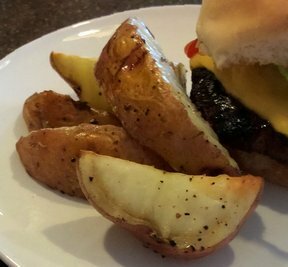 Thinly slice potatoes, approximately 1/4 inch thick. 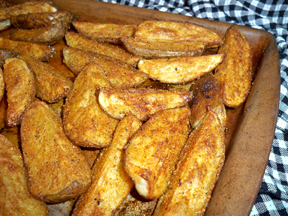 In a large zipper bag, combine oil, salt, pepper, garlic powder and parmesan cheese; mix. Add potatoes and mix to combine. 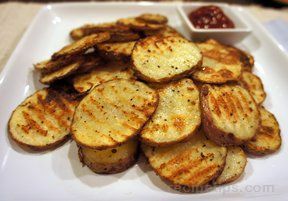 Place potatoes in a single layer on pepared baking sheet. 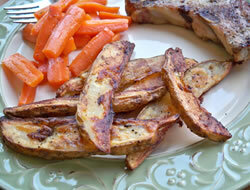 "I used Montreal Steak Seasoning, which has the salt, pepper and garlic in it (along with some other good stuff). I skipped the Parmesan cheese and didn't even miss it these were so good. We fought over the last one."